Earlier this week, Ciara LaVelle of the Miami New Times informed us that this year's edition of the Borscht Film Festival — a (roughly) annual event "that showcases films created by emerging regional filmmakers telling Miami stories that go beyond the typical portrayal of the city as a beautiful but vapid party town," according to its website — would feature an animated short entitled "Adventures of Christopher Bosh in the Multiverse," featuring a superheroic cartoon representation of the Miami Heat big man "on an Odyssean journey through neon-hued space." This, of course, sounded amazing; we wished to learn more. In the 12-minute, neon-hued, tripped-out film, Barfar the Wolfman Mystic guides Bosh on his journey into our reality. 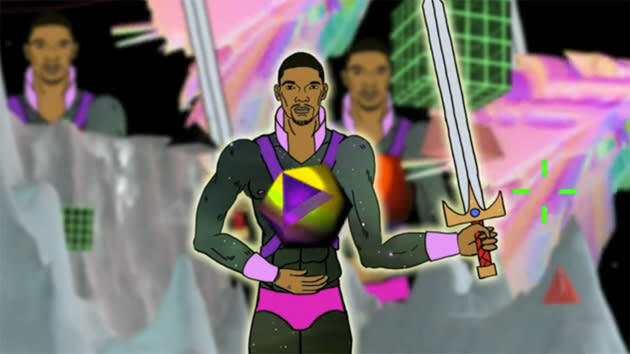 "Bosh's main obstacle is himself. He lives outside of our problems until he is forced to deal with our world," Rivera explains. The teaser trailer for the animation is below; it is worth the 68 seconds it will take you to watch it. As amazing as we expect this piece of cinematic craft to be, it appears that Bosh — or, at the very least, his representatives — might not be so stoked at the notion of Bleeding Palm or the folks behind the Borscht festival, who have dubbed the upcoming event the "Bosh Film Festival," using the 28-year-old All-Star's name, image and likeness in association with something that he A) has nothing to do with and B) does sound kind of insane. 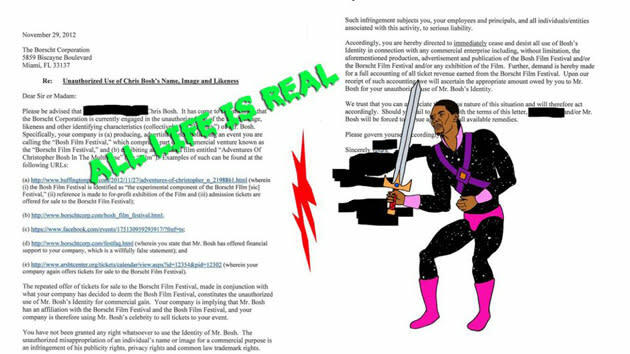 LaVelle reported Friday that the "Borscht Film Festival posted a cease-and-desist letter on Facebook last night, apparently sent from Bosh's lawyers warning that the film, and the 'Bosh Film Festival' event in which it's scheduled to screen, constitutes 'an infringement of [Bosh's] publicity rights, privacy rights, and common law trademark rights.'" "You have not been granted any right whatsoever to use the Identity of Mr. Bosh," the letter reads. "The unauthorized misappropriation of an individual's name or image for a commercial purpose is an infringement of his publicity rights, privacy rights and common law trademark rights. Such infringement subjects you, your employees and principals, and all individuals/entities associated with this activity, to serious liability." The letter goes on to direct the Borscht Corp. "to immediately cease and desist all use of Bosh's Identity in connection with any commercial enterprise," including the promotion of the festival, and notes that failure to comply will result in Bosh's reps seeking "all available remedies," insinuating that legal action could be forthcoming if they press ahead. They also said this proves "the whole universe is in danger," then invited Bosh and Mike Miller (who apparently has a cameo role) to the free debut screening at the Miami Art Museum on Dec. 14, which seems nice. In a slightly more serious follow-up with Liz Tracy of sibling alt-paper the Broward Palm Beach New Times, Chris Quinn — not the former member of the Heat, New Jersey Nets and San Antonio Spurs, but rather the festival's "Minister of Jurassic Arts" — expressed doubt that any action would really be taken: "I really don't think Bosh is going to sue this little nonprofit for a free event at an art museum [...] and if he does, it's because he really is a disgraced star prince from another dimension." That sounds about right to us; for one thing, we're not entirely convinced the cease-and-desist is real rather than just part of sort of an odd guerrilla marketing campaign for the short, and for another, this doesn't necessarily seem like the kind of thing Bosh or his people would have to put the kibosh on to avoid either irreparable harm to his reputation or being cut out of an incredibly lucrative revenue stream. Then again, if it is real, if the idea of being portrayed as an exile from the planet Zorg-nok 7 who is charged with keeping the Great Sword of Gorg-Dak-Tox is just too much for Bosh to stomach and if he would prefer the film never see the light of day, he very well could put the legal system to work in the hopes of doing so. We're crossing our fingers in the hopes that no lawyers need get involved, and that the film is allowed to breathe free and reach as many eyes as possible in the greater Miami area (and later, hopefully, the Internet). We really want to know what role Mike Miller plays in all this.